Recent research into the workings of our brain has stirred the debate with respect to intuitive decision making vs rational decision making. How much should we rely on intuition when making difficult decisions? In The Power of Intuition, Gary Klein suggests that 90% of critical decisions are made using our intuition. Even if only partially true, this would suggest that any approach to improved decision making, should address this style. When talking about intuition, we are describing something that is known, perceived, understood or believed by instinct, feelings or nature without actual evidence, rather than by use of conscious thought, reason, logic or other rational processes. This does not imply that intuitive decision making is irrational. Instead, we mean that the explanation for a choice is not directly available through conscious or logical thought. Brain research points to parts of the brain that work simultaneously with our conscious thought processes, acting as parallel intelligent systems. These systems will create responses (usually emotional) that compete with each other in determining a person’s response. When guided by experience with a previous pattern, these responses could be considered the result of intuition. Intuition plays a significant role in the choices we make. Unfortunately, working alone, intuition can be the source of significant errors in the course of making a decision. Here are some of the problems with intuition that can be avoided with a structured Decision-making process. Flawed information – Intuition decision making will respond quickly to inaccurate, insufficient, unreliable, or incomplete information based on patterns from previous experiences. Short term Emotional bias – Cognitive research has shown that even experts’ decisions are influenced by unrelated emotions during the time of making a decision. Insufficient consideration of Alternatives – Intuition generally relies on pattern recognition and will point to solutions that have worked well with the current perceived pattern. This will limit considered options even though you may be dealing with a new decision situation that might require a novel or unique solution. Prejudices – Emotions help form our intuition and can allow flawed experiences to over-rule sound facts and evidence. Lack of Openness – Every person has a different experience base that provides the platform for their intuitions. Given that one’s intuition is not easily explained, it is difficult to use intuition in a group context. Inappropriate Application – People that have good experience, expertise, and intuition in one area can become over confident and apply their intuition in an unfamiliar or unrelated area. This also includes using “Rules of Thumb” that may not match the needs of the current decision context. Can Intuitive Decision making be Learned and Practiced? Experts at MIT 2007 and the Marine Corps (Krulak, 1999) believe so. Cognitive models are continuing to be developed and evolved that help us understand intuition and decision making. The Recognition Primed Decision Model, suggests that recognition of patterns or cues is an important element of intuitive decision making, along with an ability to perform a rapid mental simulation of how an option would perform against other previously successful outcomes. This model, and others, point to the following approaches for improved intuitive decision making. Use a Structured Process when time allows – This will provide a framework for capturing and learning from previous decisions. It will also guard from errors that can occur when using intuition. Our 4-step Decision Innovation process strongly leverages this approach. Listen better – Improved listening will ensure getting more of the situational information. The better formed the pattern, the more likely that intuition will provide a solution well matched to the problem. Reflect on a decision before implementing (if you have time) – Look for areas where emotions might be distorting your perception of the current situation. Examine your Beliefs – Are they based on reliable facts and evidence? Consult others – Get feedback and validate that your decision seems reasonable. Also, pay attention to disconfirming assessments. Communicate – The reasoning behind your intuition can sometimes be made explicit through discussion with others. Failure to do this in a business decision may undermine its implementation. Increase experiences – Try new things. Patterns develop from experiences. More experiences will create and shape successful patterns. This leads to better intuition. Learn thru repetition in different environments – Repetition in different emotional environments will help improve the consistency of intuitive decision making. Learn to recognize and interpret your Emotions – Emotions provide signals of previous patterns and experiences. Learning what they indicate and their reliability improves your ability to know when to count on your intuition. Create the right Learning environment – Better intuitive decision making comes from making more decisions. An environment that can provide tolerance and/or low risk for mistakes, and that examines decisions without attacking the pride and dignity of the person making them, will lead to better intuitive choices. 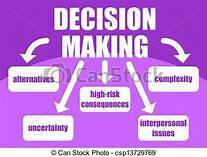 Use decision making Games – Games simulate life and provide a low risk environment to develop the patterns that can improve intuition. Situational Assessment and Case Studies – Used in business and the military (e.g., After action reviews), studying previous outcomes with a focus on the decision making processes will help build patterns for intuition. When does it make sense to use an Intuitive Decision-making style? Starting with the easy case, it certainly is reasonable to use Intuitive Decision-making for trivial or low value decisions. Decision failure will have little consequence, and intuition will provide for a quick selection. These decisions are simple, not important, and in many cases may result in habit. Choosing the same kind of coffee every day because you are happy with how it tastes is a good example. Decisions that involve emotions are often subject to a fair amount of intuition and will often play a major role in personal relationships. However, emotions can change, and when relationships run into difficulty, do not be surprised if your intuition is no longer generating the outcomes you expect. At these times, relationships take work because intuitive decision making has to become more open, explicit & rational. People find that they may need to make choices that are not supported by their emotions. Finally, when speed is critical to a successful outcome, expect to have to rely more heavily on Intuitive Decision-making. Examples include choices made in critical situations (ie, first responders arriving at a crisis scene). First Responders undergo extensive training that helps build the experience patterns that will improve their Intuition & Decision-making. You can do the same with trusting your Intuition to build confidence in it. Comments: What has been you experience using Intuition in Decision-Making? For more Info, click on Decision-Making.